Files on SLMC – Attempt through CID to stop SLMC Hakeem to cross over! Investigations are to be launched into three files existing against minister Hakeem. Sergeant Bandara, under the supervision of chief inspector Indunil, has been appointed for the purpose. One file relates to his breaching of financial and administrative regulations by purchasing a tug from a Muslim businessman without following tender procedures when he was the minister of ports and shipping. Another deals with the state sector jobs given by obtaining money through his coordinating officer Hassen Faiz, while the third is about pushing, not preventing, his paramour Kumari Cooray to commit suicide. The CID has already made submissions to courts regarding Kumari’s suicide. Some time ago, the CID submitted to courts that her deathbed confession made no mention of Hakeem. Two Rupavahini Corporation cameramen who had videoed her suicide had given the two CDs to the CID. Since these alone are inadequate to file charges against Hakeem, the case has been categorized as C3. However, in order to frighten him, the case has been reopened. Chandra Fernando, former IGP, who is presently director-general of the defence ministry’s internal and special investigation unit, yesterday (25) afternoon took these three files into his custody. Minister Hakeem was summoned on the same day to the CID to record a statement, but he didn’t make an appearance. CID officers are awaiting DG Fernando’s instructions on how they should deal with this case, the CID sources told ‘LNW’ further. Embattled Rajapakse regime petering out :3 more cross overs – new chief minister Daya Gamage ? <span line-height:1.6em”=””>(Lanka-e-News- 26.Nov.2014, 7.00PM) The meteoric rise in unpopularity of the currently embattled Rajapakse regime was further confirmed when three members of the All Ceylon Muslim Congress (a constituent party of the UPFA) of Minister Rishad Badurdeen, of the provincial council of the east where the ruling party holds power also decided to quit the government and become independent members . It is noteworthy that they contested under the betel leaf symbol of the UPFA. 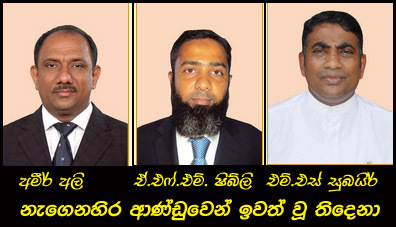 The three provincial councilors are : M.S. Zobair, Shibly and Ameer Ali Shihabdeen of Batticaloa district.. The SLFP has 5 members , along with them the ruling party has 22 seats in the council which include the parties forming the ruling alliance. The opposition had 15 seats , but with the exit of these three members ,the ruling party will have 19 seats, and the opposition 18 seats ,and the chief minister of the PC east is Majeed Najeeb . Consequently ,the chief minister Najeeb’s post is in peril , and already discussions are on by the opposition to capture the ruling power of the council , and to appoint a new chief minister . Among the names proposed for the chief minister post is UNP national organizer Daya Dharmapala Kilittuwa Gamage alias Daya Gamage. The Bodu Bala Sena organisation has decided to support Mahinda Rajapaksa in the forthcoming presidential election. election.The General secretary Galabadaaththe Gnanasara thera had said addressing the media in Colombo and had requested Maithripala Sirisena to come back to the government. The UNP yesterday declared that the joint Opposition would retain the executive presidency sans what it called dictatorial powers currently exercised by incumbent President Mahinda Rajapaksa. Maithripala Sirisena would remain the President, it said. The announcement was made by top UNP spokesman Mangala Samaraweera, MP, at a media briefing held at UNP headquarters, Sirikotha. The UNPer emphasised that the process of transferring power to the Cabinet of Ministers would be done in accordance with the Constitution.